Wait what? Did I read the press release wrong? It said this was Joshua Budich’s FIRST solo show? We find that unbelievable and LONG overdue! Well kudos to Spoke Art Gallery for stepping up and giving Mr Budich his time in the spotlight! Spoke Art spoke with Joshua about the exhibit and here is what he had to say over on their BLOG. Tell us a little about yourself. What does a typical day in the life of Joshua Budich look like? With 2 children and four busy schedules, we run a very tight ship at the Budich House (to say the least). A typical day would be Papa/Mama getting up at the crack-of-dawn and getting started with breakfast prep for ourselves and the kids. Routines for all kick in at 7am promptly; baby-girl and big-boy run around like crazies, eat their bfast, pack the backpacks, build a lego tower, and head to daycare and 1st-Grade respectively. Then it’s time to get down to work! Drawing, drawing, drawing…. Tubing, tubing, tubing… working, working, working… with, the occasional trip the farm for our CSA pickup thrown in, among other errands. Evenings after the kids are picked up are hectic and exhausting but, satisfying to the soul, especially when there’s a lightsaber duel! Kids are tucked into bed, and now Mama and Papa get to chill out with a TALL glass of vino and some of our favorite shows. Hit the sack, and do it all again the next day! When did you start watching anime and how has it influenced your work? It’s debatable, but you could argue that Voltron is, in a way, Anime-esque. So, that would probably be my first experience with anything resembling a Japanese-style of animation. However, I think I first became aware of the greater genre of “Anime” when I eventually caught on to Robotech, and of course, when the original Nintendo came out, many of the games were inspired by Anime. The hyper-stylized, frenetic animation was like a bolt of inspirational lightning to a young artist. Once I got a taste, my eyes were open to whole new world of characters and themes. 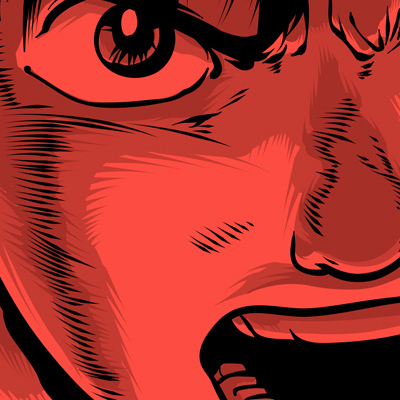 No longer was I tethered to a bland, pseudo-realistic, Disney-esque approach to the drawing. 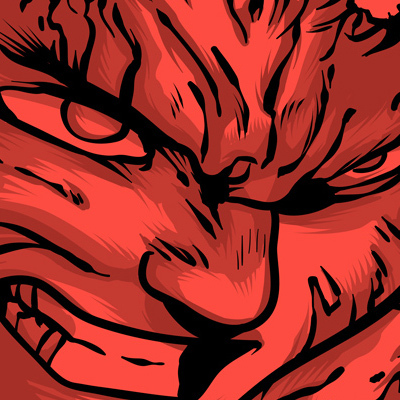 Anime has had a huge influence in my work! Is there an anime that really inspired you growing up? 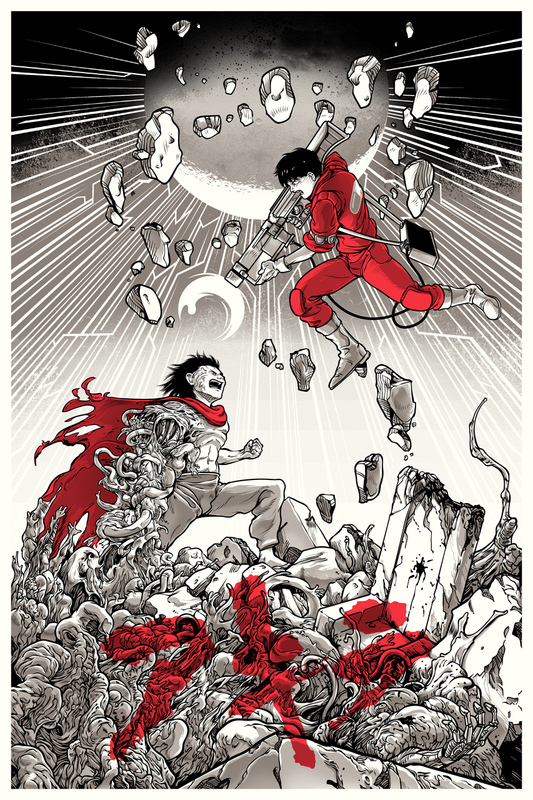 Once I saw AKIRA, my mind was forever blown! 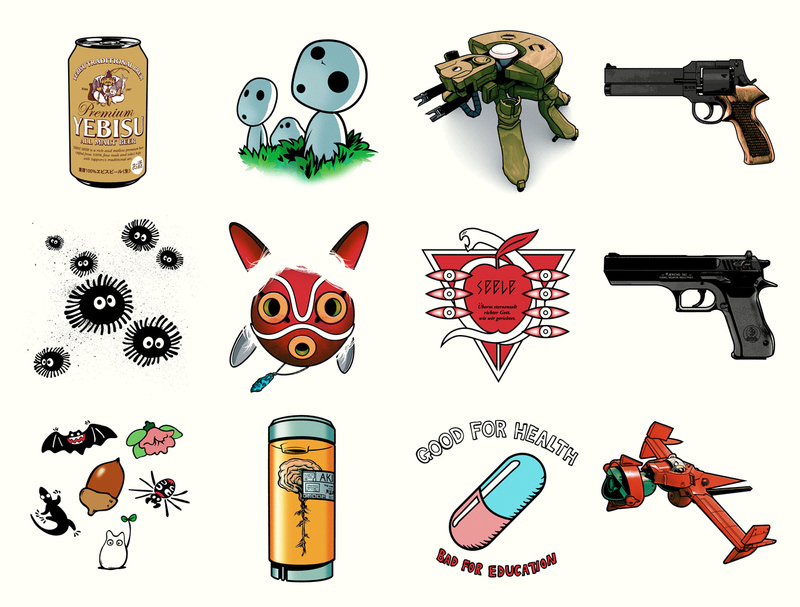 I’ve done half a dozen pieces for AKIRA already, and I don’t see my love for it ever diminishing. The film, and the greater works of Katsuhiro Otomo, are an endless source of inspiration for me. For your upcoming show with Spoke Art, how did you narrow down the list of anime you wanted to create work for? Narrowing down the list was an incredibly difficult task. Once we had decided on the theme for the show, my excitement for the vast catalog of incredible Anime flowed into an utterly ginormous list of possible subjects to tackle. Ultimately, the decisions we made about which 6 subjects to begin with came down to simply choosing which ones we all thought were the most influential, and most classically associated with the genre. When sitting down with a film or show topic for your next poster, how do you choose the imagery that ends up in the final product? Can you talk about what the best part of your specific creative process is? 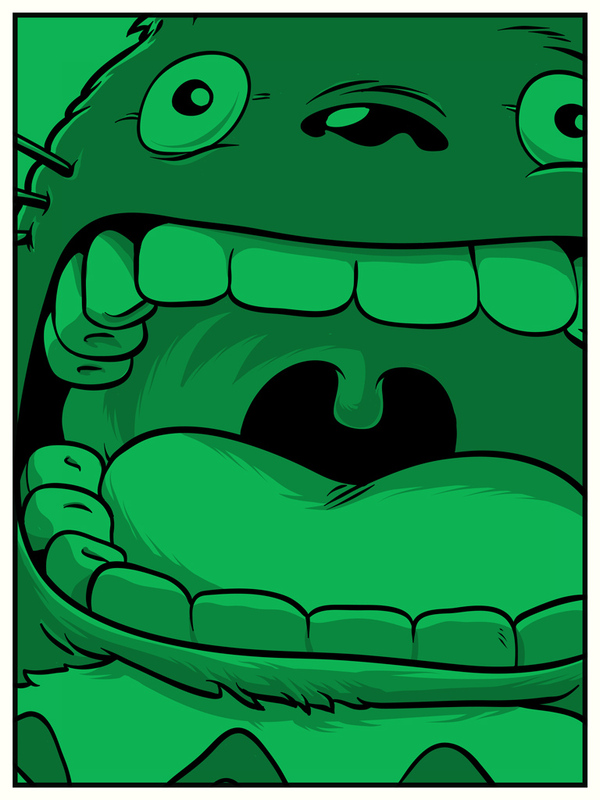 I love the inking-stage. I work digitally at this point, but I use a drawing-tablet so that the process is as close to traditional pen-and-ink as possible. During the inking stage, I can zone out and just let the lines flow. It’s an incredible intense mental exercise, but extremely satisfying and strangely relaxing at the same time. It’s no secret you’re a big Star Wars fan, and a majority of the animes in Otaku Obscura are of the sci-fi, post-apocalyptic variety. What draws you into these kinds of stories and themes? The short and sweet answer… I was a little boy during the height of the OG Star Wars- craze, so a love for sci-fi runs deep within the very fibers of my being. To elaborate… I think these stories of space, and starships, lasers and robots and impossible technology, are attractive to me because many of the limits of the “real” world don’t exist. You can honestly let your imagination completely take over and basically do whatever you want with the genre. Post-apocalyptic… Well, some may consider my world view, and faith in humanity as a whole, leans towards the pessimistic/cynical side. When the bomb drops… When the water dries up… When the gas runs out… What will happen then? It’s terrifying, and fun to think about! Studio Ghibli has produced an amazing collection of animated films over the past couple of decades, how do you decide My Neighbor Totoro and Princess Mononoke were the two you wanted to do? 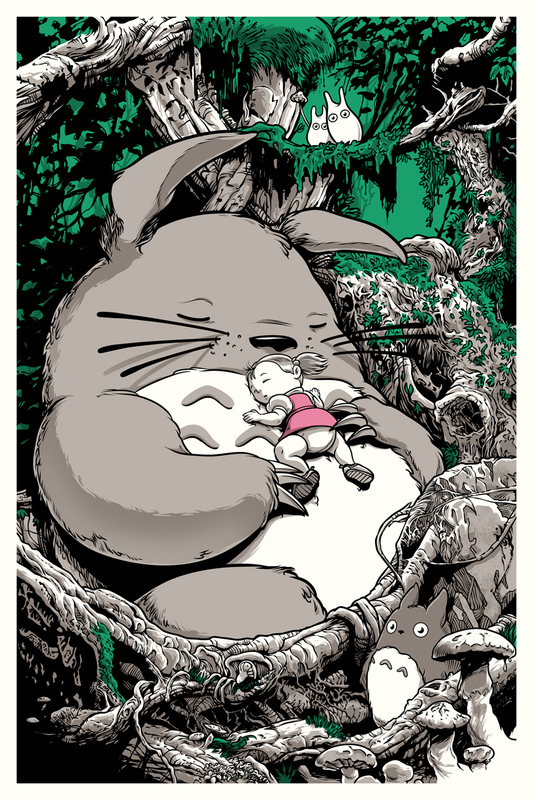 Totoro was a no-brainer for me. I introduced my son to the magical world of Ghibli (and, Anime as whole), with his and my first-ever viewing of this Miyazaki masterpiece. We were instantly in love with this film! I had to pay a modest homage to Totoro. 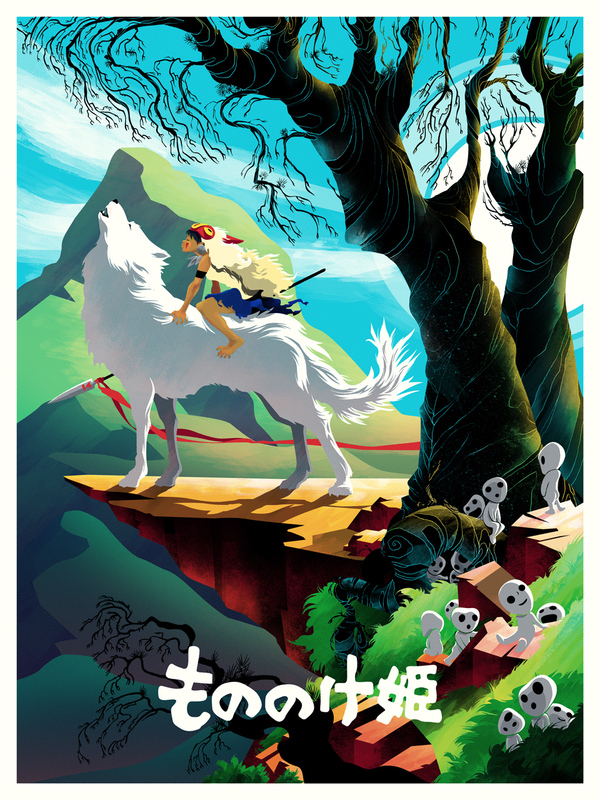 Mononoke is, of course, another completely brilliant, must-see piece of animation. I had to choose it as well. However… these are just the beginning! Paying tribute to the brilliance of Miyazaki will never end for me. More pieces to come! Would you rather be stuck in the world Evangelion takes place in, or the world Akira takes place in? What show or film do you want to tackle next? 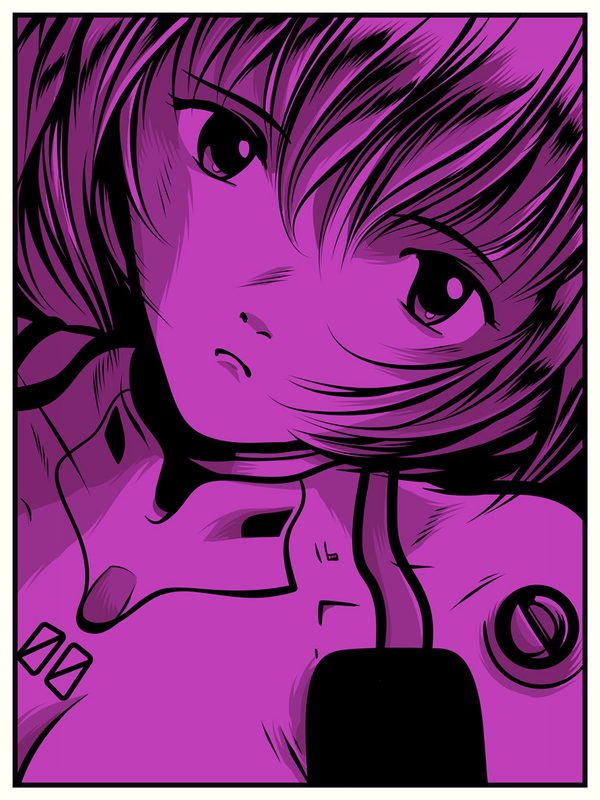 My gut tells me Evangelion. At least there is some modicum of normalcy there. AKIRA… especially after Neo Tokyo E.X.P.L.O.D.E.S… scary. This show is going to be awesome and we are REALLY bummed we can’t make it. Joshua will be in attendance, giving out high-fives to fans and accepting all verbal accolades with a smile and a nod in your general direction. As an EXTRA added bonus, the first 100 folks in line will get a complimentary 6″ X 6″ screen print entitled “Twelve”. (Seen below) Yep we said “Free” so get in line early! Here is the freebie for the first 100 fans! 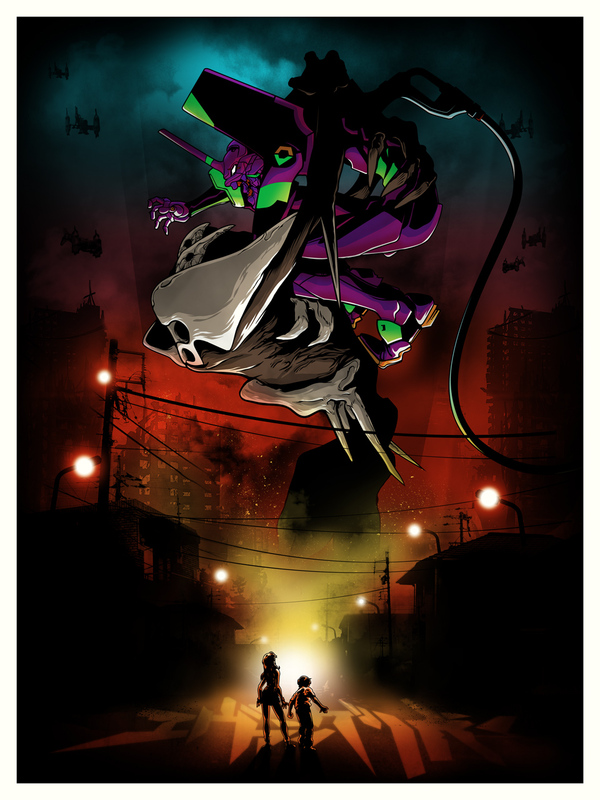 This entry was posted in Art, Pop Culture, Posters, Star Wars and tagged Akira, Cowboy Bebop, Ghost in the Shell, Japanese animation, Joshua Budich, My Neighbor Totoro, Neon Genesis Evangelion, Otaku Obscura, Princess Mononoke, Spoke Art Gallery. Bookmark the permalink. 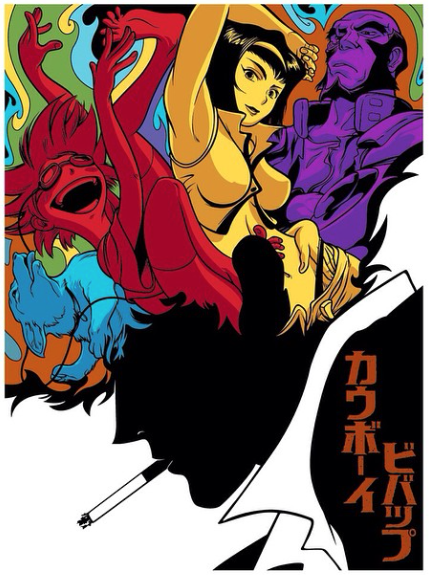 1 Response to Spoke Art To Launch Joshua Budich’s DEBUT SOLO SHOW: “Otaku Obscura” This Saturday, 10/ 4/14!